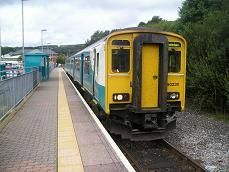 Bridgend is a four platform station with two mainline platforms and two other platforms, where trains from the Barry and Maesteg lines park up. Most trains to and from Maesteg tend to use the main lines as they mostly come from Cardiff and even Cheltenham. The train I get is the usual Class 153 two car DMU and has come from Gloucester. We leave on time and pass terraced houses on both sides, before leaving the mainline and turning northwards. It is now single track all the way. We pass a factory on the right followed by wasteland, whilst on the left are cream coloured houses. We soon arrive at Wildmill, which has a single platform and a turquoise coloured shelter. It is situated on an embankment, but as soon as we leave we go into a cutting and then onto another embankment, such is the terrain of this line. We are soon out into the countryside and doing 50 mph on unwelded track. We go into a short tunnel, before passing under the M4 on the left. We then slow for Sarn station. Like Wildmill, it has a single platform and turquoise shelter. We then go over a river and are now travelling at about 30 mph. It is mainly foliage on both sides of the track, though you can see some houses behind the trees. We then arrive at Tondu station, which has a signal box just beyond the station to control the freight lines that go off to the left and right of the station. The station has its original canopy still in place for a shelter and the old platform is still there opposite. We stop at the signal box to exchange the token, before going into a cutting and past a semaphore signal. The track curves to the left and then the right as we start to climb. There are a few houses on the left and then we are out into the countryside once again. We go past a water treatment works on the right, though it becomes mainly foliage on both sides again. We enter a cutting as we climb into a more hilly landscape, before passing a housing estate of detached houses on the left and older semis and terraces on the right. We then come into Garth station, which again has a single platform and turquoise shelter. As we leave we see a large hill on the right and barely reach 20 mph as we continue to climb. We then stop at Ewenny Road station, which is identical to all the previous stations. There are terraced houses on both sides as we still climb higher. Houses start to cover the hillsides on the left and then we arrive at Maesteg station. It has just a single platform and turquoise shelter, with a car park next to it, though it does have an electronic train information board. Summary: Another recently opened branch line in South Wales, which is doing a valuable job linking up isolated communities in this part of Wales.